So what's the fuss about these yolks anyhow. Well, you've probably seen the ads (if not, look here). "Hair goes in, curl comes out". It really is that simple. Well, with a few provisos too (we'll get to those in a minute). The hair should be clean, dry, brushed through, and not overloaded with product. Don't attempt to put your hair through this if you haven't combed out any snarls first! Similarly, as with all concentrated heat devices, don't use it on wet hair and a hair protector product (a spray or a leave-in balm) is always recommended. In general, it will work best with hair sections 3cm across and less - if you attempt to overload it, it will let you know however. It looks scary in the ads, but it gently clamps and pulls your hair into the device, we're not talking death-grip here. And it's easy to release: just open up the handles. Easy peasy. 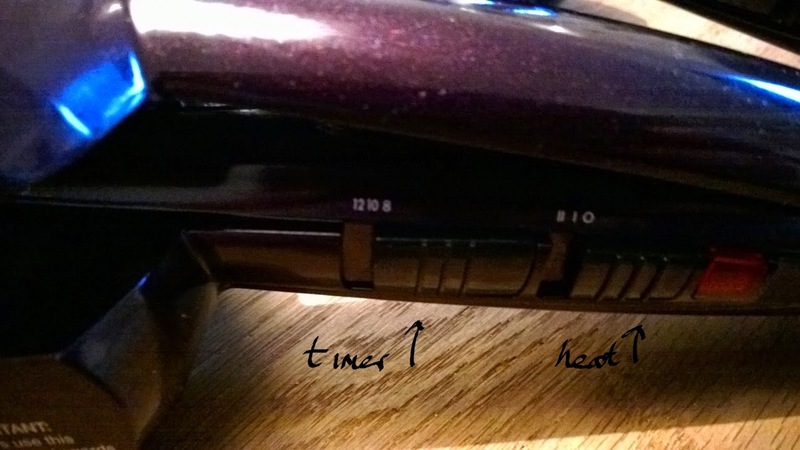 Switch it on, sort out your timer, temperature and (for the pro version) curl direction settings. Look below for the geeky info on these settings. Feed your hair into it wherever you want your curl to start (I prefer about a third of the way down its length from my scalp) by closing down the handles at that point. Watch your hair wind up into the device in general wonder awe and amazement (and, if you're like me, general cringing as you'll assume it's going to pull on your hair - don't worry, it doesn't). Count down the beeps (if you don't have the pro version and you haven't switched the beeps off) - you'll hear four rapid beeps at the end, indicating that your hair should be removed. 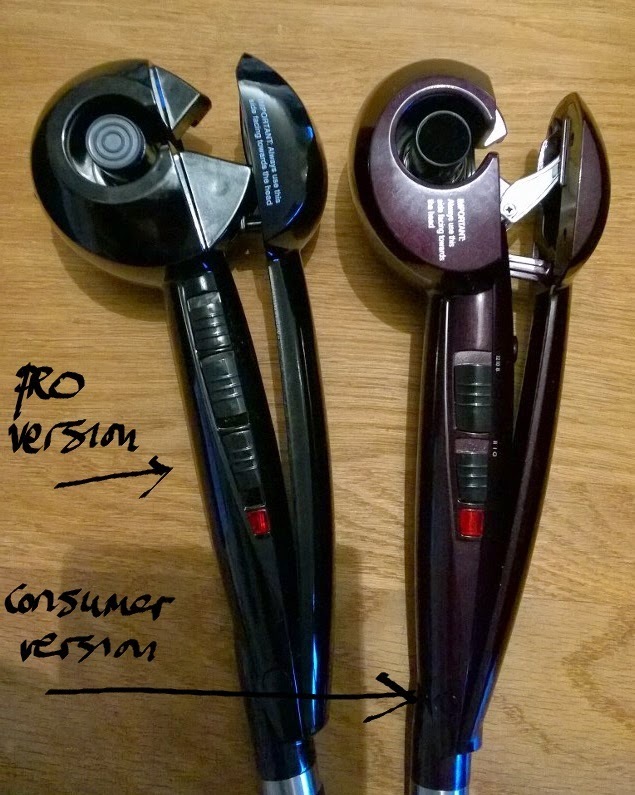 Release the handles to free the curl and really gently pull the styler away from the curl (if you pull the styler away without releasing the handles, your curl will straighten-out and you'll have to curl it again). That's it. No big deal. 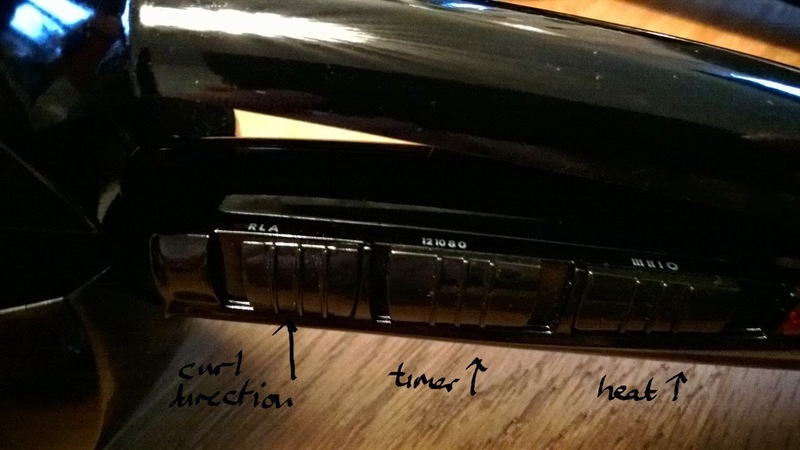 OK so there's a few general guidelines when it comes to curling hair. 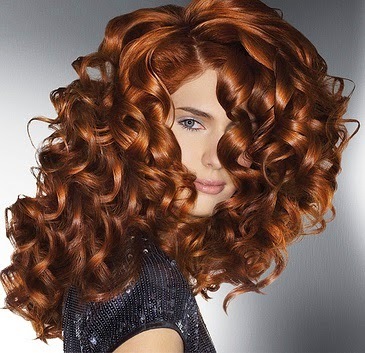 In general, you create volume and defined curls by having the curls alternate direction with each successive layer. Or you create waves by having the curls all going in the same direction. And importantly: curls set as they cool down - they are created by heat, but set by cooling. So avoid touching them until they're cold. (I was going to do a video but honestly, there are so many of these on the web, just do a search online and you'll be tripping over them. They really are as simple to use as the promo videos suggest too). ... then you'll really need the Pro version here, to guarantee you can control the direction of the curl. then you can use either the Pro or the consumer version. For temperature and timer settings, you'll really need to experiment a bit, as the style you want to create will require different settings but these will vary depending on your own hair type, condition and length. In general, though, where temperature is concerned, it's not a bad idea to use a lower temperature for fragile, damaged, chemically- or colour-treated hair. Better condition hair can tolerate higher temperatures (and/or longer times). That's the main rule of thumb. And what will the different pre-set time settings do for me? Simple. Applying heat for a longer time will give a tighter curl. 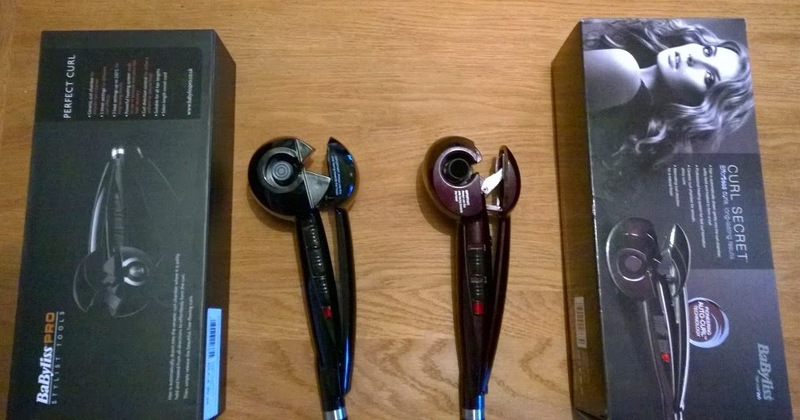 So use a lower time setting if you want loose beachy waves, use the highest time setting for defined spiral curls. Finally, what about size of hair section? Again, this one is a no-brainer. Curling a smaller section at a time will give you very tight, spiral, defined curls, and lots and lots and lots of them. Curling a larger section at a time will take a lot less time and - if your hair is either particularly thick and/or long - give you a slightly looser finish. 3cm is the general maximum recommended size of each section. 30cm difference in cord length (1 foot). No biggie.